« Will American Exceptionalism Be Destroyed by the Entitlement Society? Everyone has a cross to bear in life, some sort of burden or obligation, often self-imposed. For some inexplicable reason, I’ve decided that one of my responsibilities is to educate a backwards and primitive people who seem impervious to common sense, simple logic, and strong principles. As you’ve probably guessed already, I’m talking about Republicans. I’ve already identified them at the Stupid Party, but they seem especially ill-informed and clueless on the topic of government borrowing. I’ve specifically warned that they are economically (and politically) misguided when they focus on deficits and debt as America’s main fiscal problem. 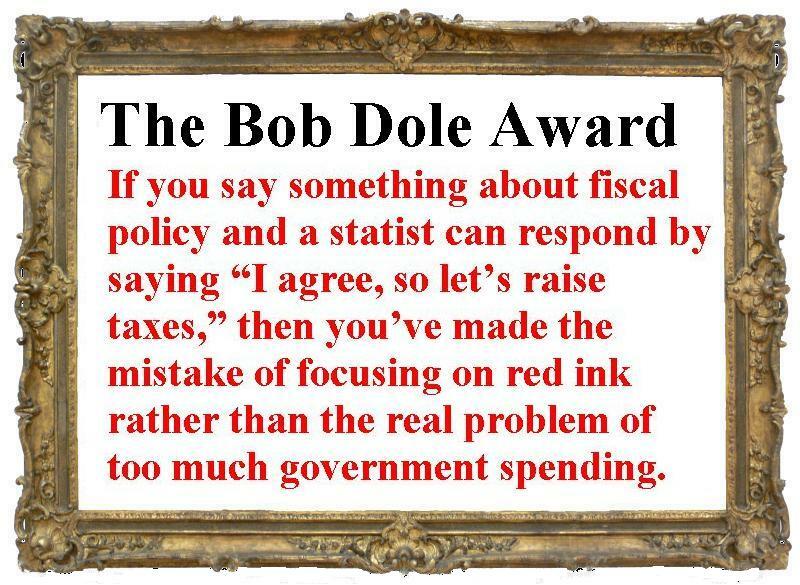 I even created a “Bob Dole Award” in hopes of getting this point across. Simply stated, fixating on debt opens the door for higher taxes. And does anyone think our economy would be stronger, or our fiscal position would be better, if we replaced some debt-financed spending with some spending financed by class-warfare taxes? Especially since the higher taxes almost certainly would trigger more spending, so government borrowing would stay the same and the only thing that would change is that we’d be saddled with even more waste. Notwithstanding all my educational efforts, Republicans couldn’t resist jumping up and down and making loud noises earlier this week when the national debt hit the $16 trillion mark earlier this week (a google search for “$16 trillion debt” returned more than 24 million hits). So let’s walk through (again) why this is misguided. First, let’s clear up some numbers that cause confusion. Republicans are complaining about something called the “gross federal debt.” This number is largely meaningless (see table 7.1 of the OMB Historical Tables if you want to look at the details). The latter number is simply a total of the IOUs that the government issues to itself, most notably the ones at the Social Security Trust Fund. But the “assets” in the Trust Fund at the Social Security Administration are offset by the “liabilities” at the Treasury Department. This is an empty bookkeeping gimmick, just as if you took a dollar out of your right pocket, put it in your left pocket, and left an IOU in exchange. This number depends on a whole range of assumptions and can be measured in current dollars, constant dollars, and present value. I prefer the middle approach, which adjusts for inflation, and it’s worth noting that “unfunded liabilities” for Social Security and Medicare are more than $100 trillion. Now let’s get to the most important issue. The reason we should worry about that $100 trillion number is that it is an estimate of how much the burden of spending will climb in the future. That additional spending will weaken the economy whether it is financed by borrowing or taxes. Sort of helps to explain why entitlement reform is completely necessary if we want to keep America from a Greek-style fiscal collapse at some point in the future. Here’s my video on the topic. In an ideal world, Republicans would not be allowed to talk about fiscal policy until they were first strapped in chairs, given a bunch of ADD medicine, and forced to watch this on automatic replay about 50 times. Now for the all-important caveats. Yes, a nation can reach a point where debt becomes a problem. All you have to do is look at the mess in Europe to understand that point. And I’ve shared numbers from both the Bank for International Settlements and the Organization for Economic Cooperation and Development to indicate that almost all nations – including the U.S. – are going to face similar problems if government policy is left on autopilot. What I want people to realize, though, is that governments only get into that kind of mess because there’s too much spending. Government spending is the disease. The various ways of financing that spending – taxes, borrowing, and printing money – are symptoms of the underlying disease. Well, since the debt obviously doesn’t matter I think we should simply borrow enough to make every member of our nation on multimillionaire. Sounds good to me and based on your illogical considerations it must sound good to you too, right? We’ll just call it the “gross domestic debt” and shrug it off. And gosh I wish I was a Democrat so that I would be all smart and brilliant about all these complex issues like you guys. But unfortunately I have to trudge through life as a poor, foolish conservative. I am publicly shamed. You are absolutely right about the total irrelevance of the “debt held by federal government accounts”; I an trying to make this point to my Russian friends for many years. You may add to this that the “debt held by the public” is also, as it were, not very relevant as well. Public debt of the single most important reserve currency country is dramatically differenct from the debt of other countries which must remain concerned either about their solvency (if this debt is in foreign currency) or about their exchange rate. US federal debt is, in fact, has little common to the very concept of debt at all. From the point of view of holders of US government paper it is not a risky investment to be compared to other investment options and opposed to secure cash holdings. Instead, US government paper is a very close equivalent of cash held by financial institutions and central banks as the most reliable and least profitable asset. Thus, expansion of the US debt is to a large extent simply a function of global demand for dollar holdings – in other words, it mirrors global demand for reliable money of which the US remains the leading producer. This debt can be easily monetized by the Fed and precisely because everybody knows that, there is no rush to exchange government paper into ready dollars. Thus, global demand for dollar holdings is the only natural constraint to debt expansion. Turning to the unfunded liabilities, it should be noted that scary numbers reflect relatively long horizon and are critically sensitive to relatively small (and not politically challenging) changes in various parameters, like retirement age, social assistance eligibility, etc. I agree with you re: the irrelevance of gross debt and “just” focusing on taxes — but aren’t you ignoring, a) debt markets key in on metrics like Debt/GDP, interest / budget etc., and economic research suggests that insolvency / growth risk kicks in at certain debt/gdp levels?, 2) you don’t answer your own question as to what the REAL issue is, ie gdp growth at / above 3% trend AND government spending cuts (or, in other words, what us dumb Republicans SHOULD be focusing on, which i entirely agree with). what im missing is, i thought ryan/romney have (somewhat clumsily) talked about both? Dan, thanks for the reminder and your persistence in continuing to inform us all. We need to make decision based on information such as this instead of emotions. Thanks again.